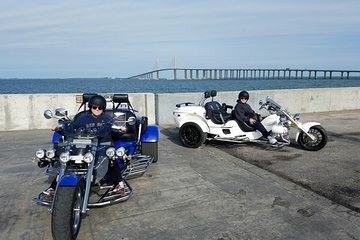 While in Florida, unleash your inner adventurer on this 2-hour motorcycle tour of the Sunshine Skyway Bridge and Gandy Bridge. First, zoom across the Gandy Bridge as you take in views of Tampa Bay. Then, cruise one of the sunshine state’s tallest bridges, the Sunshine Skyway Bridge, which has a total length of 21,877 feet (6,668 meters). Meet your driver and guide at USA Trike Adventures Cruise Excursions in Tampa a little before your departure time. For this tour, you can pick a morning or afternoon departure time depending on your preference. You’ll be given a helmet and a quick safety briefing before you hit the road. Your motorcycle holds up to three people, so including you and your guide, there’s room for one other person, too. Notice the beautiful harbor views as you ride toward the Gandy Bridge. Your driver takes you across the bridge for a closer look at Tampa Bay. Next, continue on the Sunshine Skyway Bridge. Ride down 21,877 feet, and stop for a photo op to snap pics to remember the day. Keep your eyes peeled as you make your way across because this bridge is known for cruise ships passing underneath. After speeding around the Florida roads, your guide takes you back to where your tour began — USA Trike Adventures Cruise Excursions in Tampa.